I sit here with a huge grin on my face. And by huge I mean very pregnant, fat grin. And hugely happy grin. Haha. Walt and I calculated a few months ago that by the time Emerson gets here we will have been pregnant 42% of the time we’ve been married. We need a break! I’m going to start a crowd funding page for a vacation to somewhere tropical for me and the mister. Totally kidding. But we are going to take a trip… any suggestions? I’m fine on an airplane for about 2.5 hours IF I’ve been supplied with at least two drink tickets. Keepin’ it real. Anyway. I sit in my breakfast room this afternoon with a very quiet house. Fenley is with my parents. Walt is working. And I’m counting down the hours until we meet Emerson and soaking up the Spirit. Also counting God’s faithfulness in this chapter of life. I’m overwhelmed by His goodness and His pursuit today. I am completely anxious about having a c section and a new baby this week. So many unknowns. I am a realist to a fault. Many things that can still go wrong. Much potential for complete heartache. I’m not naive or oblivious to the reality that not every healthy, term pregnancy has a happy ending. Anytime a mama goes in to have a baby, there are simply risks and I know this. I’m also a chicken. But God… He makes me brave and excited and happy and puts this goofy fat grin on my face at almost 39 weeks pregnant. He has come to me today. To me!!!!!! What??? He comes to me??? And you know what He’s done? He has whispered faithfulness and reminded me of all the nuggets along the way He has given me about Emerson and shouted love and comforted and quieted and has promised to be enough. I’ve lived my worst nightmare through the diagnosis and death of Wills. And He was enough. I just spent an hour on the couch looking through pictures from 2013 and 2014 and 2015. And all I can see is FAITHFULNESS. Even pictures of Wills the day he died I see God’s perfect fingerprints. And speaking of God’s fingerprints, I have a pretty good hunch I’m about to live my greatest dream by getting to welcome another beautiful big healthy girl into the world to grow here with our family and it overwhelms my heart with gratitude. Gratitude times gratitude. He lights me up with His love and His promises. Ohhhhh His promises. Absolute medicine to my soul… flipped open my bible to this psalm TODAY after praying about having Emerson this week. “I lift up my eyes to the mountains – where does my help come from? My help comes from the Lord, the Maker of Heaven and earth. He will not let your foot slip – He who watches over you will not slumber; indeed, He who watches over Israel will neither slumber nor sleep. The Lord watches over you – the Lord is your shade at your right hand; the sun will not harm you by day nor the moon by night. The Lord will keep you from all harm – He will watch over your life; The Lord will watch over your coming and going both now and forevermore.” Psalm 121. A God that encourages, cares and loves on this little mama and any other person that comes to His throne. I lay my tarnished pennies at His altar. And He doesn’t look at me like I’ve wasted His precious time. He looks at me and says “Give me your ashes and fears and pennies and also your trust and let me give you perfect love that makes life worth living.” That’s Who is perfectly worthy of my everything. I fail Him daily and His grace abounds. He loves my offering. He loves me. If it were just me and Him, He would do it all over again. As I read back over my emails with Ruth I see deeper and deeper her emphasis on His love for us. Not what are we doing for Him but how well do we know His love? Then from that comes a beautiful work. Again, huge grin on this chubby face. 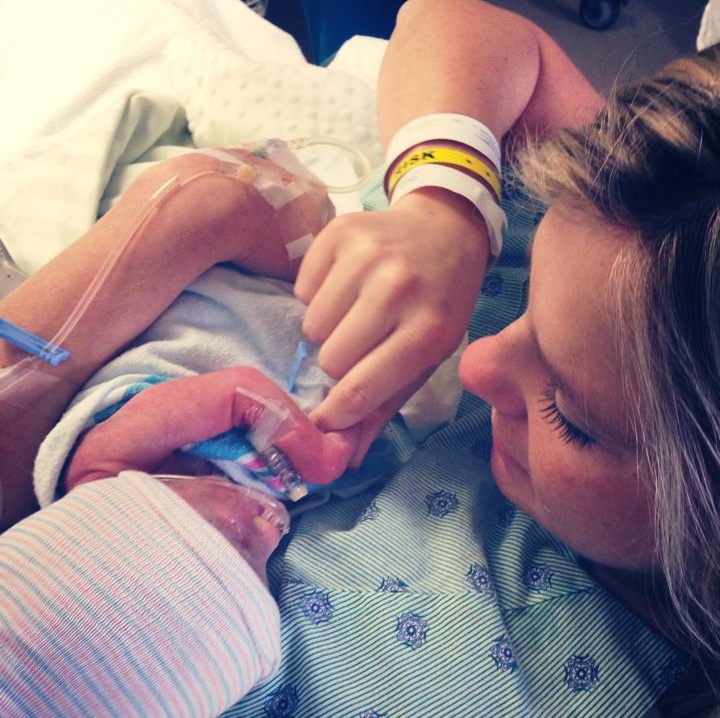 Prayers so appreciated as we anticipate having and holding and loving on Emerson! Fenley is so excited she almost goes into a convulsion when we talk about it. She is REALLY into helping out right now and is convinced Emerson is going to sleep with her in her bed the night we come home from the hospital. Lord, help us! Just a heads up. Going to start blogging more I think but going to be a little shorter and more to the point and have a few more memories thrown in so if that’s not your thing you may want to unsubscribe now 🙂 I plan to gush about my two girls a LOT. And hopefully about a tropical vacation at some point in the next 18 months. Insert another huge grin. If you would please pray for us that would be so so so appreciated. Health for Emerson. Health and peace for mama. Joy for Fenley and Walt. Obvious God fingerprints. Smooth delivery. And all glory to God, the perfect Giver of all GOOD THINGS. Love y’all and thanks for walking through the last two years with us and now as we welcome this precious miracle straight from God… stay tuned!!! 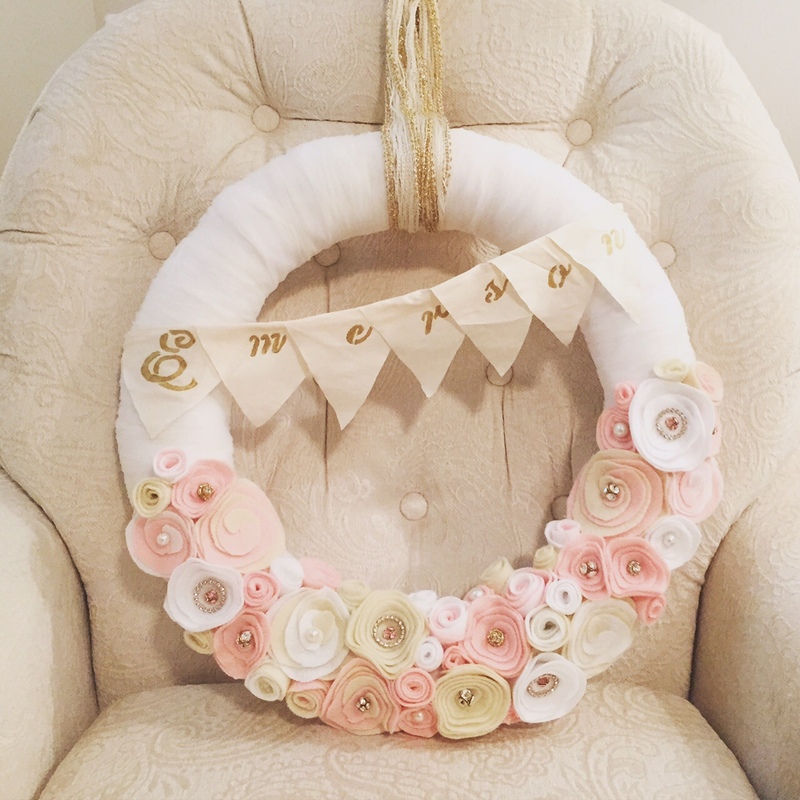 Baby girls’ precious door hanger. Had to share. Such a gift to be here in this place and I am fully aware of how blessed I am. I hope my gratitude matches the blessing. Hello little blog world! Long time, no see. I’ve missed writing, but have been less than inspired lately. Only topic I could have capably written about lately is filing insurance claims when two pipes burst and flood your 3rd bedroom or how to entertain my fun four year old all summer (pool, nap, movie, snuggle time, snack, sleep, repeat!!). What is it about going through something hard that just flat out brings out rich fruit in life? For lack of a better word, I have been “floundering” all over the stinking place. It has felt like everything I’ve learned up to this point has kinda been flushed down the toilet. Not true, I know. But sometimes feels that way. Life has a way of becoming mundane. Family drama. Guilt trips. Figuring out finances. Not being able to bake. Could go on but who wants to hear THAT melancholy list?! Ha! To try to get out of my funk I have been reading back over my emails with Ruth. Ruth is the woman who started mentoring me in my relationship with God in January of 2013. She died 12 months later in January of 2014, about 2 months after Wills died. She was completely deaf and dying of stomach cancer and you could not trick her into questioning God. How does that happen????????? Believe me, I asked her. I still marvel at her faith. She was so hungry for God and He filled her with VERY BEST thing, Himself. (Scripture just came to mind… “I am the Lord your God, who brought you out of Egypt. Open wide your mouth and I will fill it.” Psalm 81:10) Not physical healing. Not abundant material wealth. Not a perfect easy life. She would write me paragraph after paragraph about God and who He is and how He loves us and pursues us. Her home was a place where the Spirit of God was welcomed, anticipated and celebrated above all else. Her spiritual gift was prayer, and I got to experience it first hand when I met her for the first time. She prayed over me and I wept and wept and wept. She spoke things over my life that truly were straight from Heaven. Little did I know we would get pregnant with Wills just a few weeks later and that my relationship with her would be one of the huge things God was going to use to shape Wills’ story into something special. She is actually the one that introduced me to the idea of “floundering”… she said she used to flounder all over the place. I’m not sure I believe her but it helps me to reread those words 🙂 but that over time, God gently taught her how to settle into Him. She said she would go through seasons of complete isolation internally and that’s when she really learned God’s love. That God’s love is learned best alone, in the valley. Whew. I’m guessing we all have valleys and seasons of inner isolation or loneliness, so is it a choice to receive and seek God’s love in those seasons or become bitter and bored and cynical? I tend toward the latter. Just being honest. But trusting God with my story and my mustard seed of faith. Been praying that I will have a renewed desire to dive into His love. I know part of it is just being 28 weeks pregnant and tired mentally and physically. But when I read 1 Kings 19 about Elijah’s life I can’t help but see that he had an EXHAUSTING life, but it was EXHILARATING too. Please go read 1 Kings 19 and think if you wouldn’t be worn slap out!!! Yet thrilled to be God’s chosen messenger at the same time. He was obedient and simply walked with God. Thinking out loud. Tonight I sit in bed by myself. And it’s so stinking great. I do miss you Walt but gosh down time is nice! My cute husband is in New York celebrating a friends wedding so don’t feel bad for him… no telling how much fun he’s having with his down time in NYC for four nights! I didn’t want to fly pregnant (I know it’s okay to fly pregnant, but not for me and not during this pregnancy) and it’s easier to buy ONE airline ticket than TWO when you’re sending your favorite four year old to private school and getting ready for another baby girl. Oh and maybe repainting the room you just painted as a playroom. So what do mamas and daughters do while daddys are out of town? Ummm. We pick up sushi and Japanese sprite from Nagoya and watch HGTV in pajamas and play in makeup and scratch each others backs and then blog once the house is quiet! When I signed on to my blog tonight I had a notice that I need to renew my domain name “Four Bowies”. I have to admit, being the over processor that I am, I’ve been debating what to do with the blog. I hope and plan to keep writing. But can’t decide what to do with the name of the blog. I certainly hoped this day would come. When we became a family of 5 instead of 4. Being a family of 4 while Wills was here changed our life forever… personally and as a family. Fenley will never be the same. I will never be the same. Walt will never be the same. I’ve said it before and I’ll say it again: pretending he’s not a part of our family is like pretending I don’t pick Fenley up from school everyday and tuck her in every night. Wills and his life are an absolute treasure to us. And may I take a moment to encourage anyone who has ever lost a baby to share their story whenever you can. In this fast paced world we live in, to have a genuine moment with someone is rare. It’s a great opportunity to share about the value of life, no matter how short or pointless the world may call it. When people ask if this is my 2nd baby right now, I proudly (and ALWAYS) say in about 30 seconds or less that this is baby #3. That we have a son. That he had a fatal diagnosis in the womb. That he lived for 15 days. And that God used his short life to change us forever. Usually people tear up and we have a sweet moment and they smile and nod. And I tear up and smile and nod. God is still at work through that chapter and I believe that chapter will be a thread throughout every chapter from here on out. I am not sure I will ever be defined by anything more than when we became a family of 4. So… after much internal debate, I am going to keep the blog name Four Bowies even though the number is not accurate 🙂 it’s when things changed for our family and our marriage and I want to honor that chapter. So yes we will be a family of 4 HERE come August. But always always always at least a family of 5 FOREVER. I wanted to share one short quick story tonight. I have not left a ton of stuff at Wills’ gravesite. I HATE fake flowers. And the section that he is buried in is not very big and there are rules about what kind of headstone you could order, etc. So on Good Friday, I talked Walt into taking Fenley and me to Michaels to try to find a fake moss cross to put on a stake behind his stone. Well they were all huge. Walt was getting antsy in Michaels – imagine that. And Fenley wouldn’t stop “shopping” (a.k.a. grabbing stuff and insisting that she’s getting it and throwing a fit when we told her repeatedly NO!). So I said forget it. But I felt this little nudge like I needed to do something THAT day. Which I thought at first was just mama guilt. But it kept coming back. So on our way out of Michael’s I saw the cutest little nest with 3 blue eggs in it. So I grabbed it. And I kept feeling this strong feeling that it had to be THAT day that we put it on his grave. Later on Walt and I got out for a date and we stopped by to put the nest on his stone. And as we were standing there feeling all weepy I just became absolutely positively overwhelmed with gratitude. Good Friday. My goodness. It’s Good Friday. The day Jesus died to overcome the grave. Of course I needed to come today. To be reminded that HE’S NOT THERE. Could there be a more perfect day to visit a gravesite for a Christian? Than Good Friday? I mean geez. Because Jesus did what He did on the cross, we could visit Wills’ grave and KNOW that he’s not there. It was the sweetest moment. He’s in HEAVEN. He’s not reincarnated. He’s not my guardian angel. He’s not stuck in that grave. He is a CHILD in HEAVEN with CREATOR GOD. He knows the curves of Jesus’ face and how to ride lions and plays in streams of living water and can’t wait to see us again but is so happy where he is that I can’t help but sob as I type this. 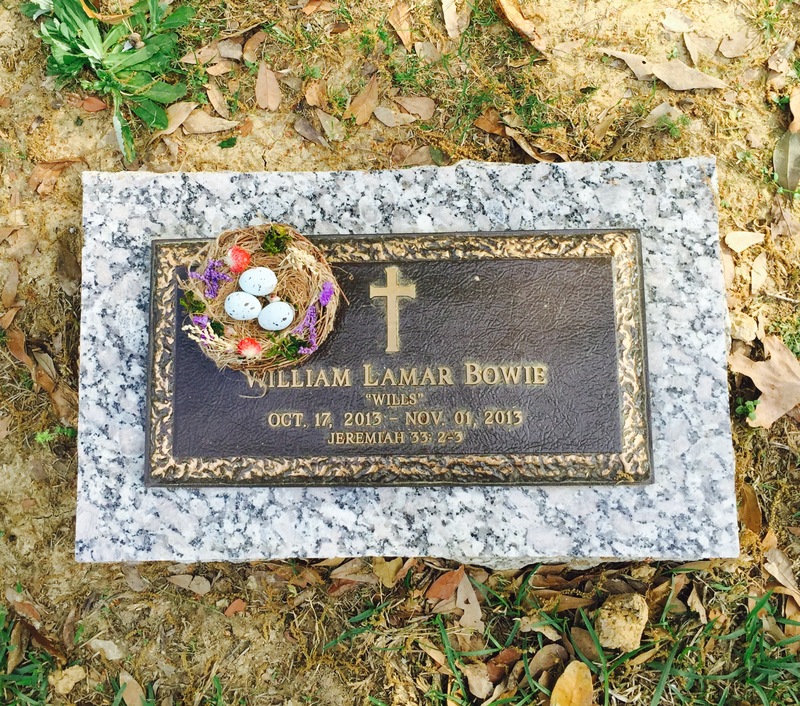 Because of Jesus, Wills isn’t in that tiny grave with that cute little nest on top. He’s in paradise. Made for a pretty thought provoking and powerful Easter weekend, I’ll just say that. Our little 4th Bowie in paradise. Goodness. Well, considering I’m a single parent this weekend while Walt is in New York I’m gonna go ahead and try to sleep. Sign Up to get new blog posts sent directly to your inbox. Child of God, Wife to Walt, Mom to Fenley Grace and Wills Lamar, who was diagnosed with Trisomy 18. God has called our journey marvelous, therefore so do we. Also, I bake French Macarons.